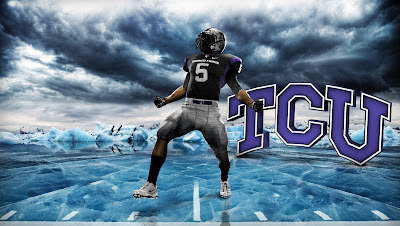 TCU will officially be joining the Big East in the 2012 season. I postulated on why that would be a good thing earlier in the year here along with who I thought might also be joining them. As conferences are beginning to shake up it opens the possibility that more schools look to make advantageous moves like TCU. The Horned Frogs will be joining the weakest conference of the "automatic qualifiers." Which will give them a much easier way into the National Championship game. Right now it looks like the 7-4 Huskies or the 8-3 Mountaineers will get the Big East's automatic bid into a BCS game. However TCU NEEDS their undefeated record to even have a prayer of getting into a BCS game. Starting in 2012 all they have to do is have the best record in the conference. TCU will also benefit from the added TV exposure. The Big East plays many more nationally televised games on ESPN throughout the year. Not only will they gain more exposure and an easier path to the BCS, but they don't lose any "market share" in their home recruiting territory. Yes, some Big East programs will gain from having their games mean something to the fertile Texas high schools but that will be negated by the equal increase that TCU will get. It's really a win for everyone involved. What this should show schools like Notre Dame and UCF is that they can do exactly the same thing TCU has done. Although both schools are having a good year, they really have no shot at landing in a BCS bowl for years to come unless they are able to schedule enough weak teams to dupe the current BCS system and finish the season undefeated. Due to the unlikelihood of that happening, they should follow the forward thinking example of the Horned Frogs and join the BCS while they still have the chance.